Make your way to the Perth train station to meet your guide and group in time for an 8:30 a.m. departure. 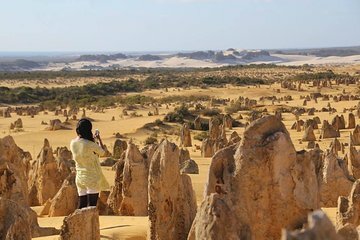 Find your seat in a comfortable tour vehicle and relax while someone else does the driving on the way to one of the area's most famous destinations, the Pinnacles, about 2 hours' driving distance away. Aboard this small bus, you will have the opportunity to drive through the Pinnacles Desert to see the fantastical rock formations up close. If time allows, visit the Pinnacles Gallery to learn more about the natural phenomena and pick up some souvenirs at the gift shop. The day's next activity is a sandboarding adventure at Lancelin. After a proper introduction and orientation, get kitted out with all the necessary gear and shoot the massive sand dunes. Refuel with lunch (sandwiches and drinks) on the beach, taking in views of the azure waters in the bay. Move on to Yanchep National Park after lunch. Keep your camera ready and eyes peeled as you stroll down the Koala Boardwalk and see some wild kangaroos in action. The last stop of the day is coastal town of Guilderton, on the banks of the Moore River, where you can take a swim or a stroll to see where the river empties into the Indian Ocean. After a full day, enjoy the scenery on the way back to Perth, where you will be dropped off at the rail station or your central Perth hotel around 7:30 p.m.
Really enjoyed our day. Well paced with lots of stops and things to see . Very well organised and would highly recommend.Friendly tour guide, knowledgeable and helpful. One if the best tours we've done. So much packed into one day and lots of interesting information learned along the way. Don't be afraid to try the sand boarding. My husband and I are in our late 50s/early60s and easily managed it! The pinnacles give you the sense of another worldly experience..Tour guide was friendly, professional and even dropped us off at Greenwood train station on the way back. Thanks so much for a wonderful day. Highly recommend..
Amazing tour guide who is very friendly, knowledgeable and supportive. We will recommend this tour to friends. We had only one day to spare, and with elderly parents in tow I chose this trip for the different experiences it offered. Yanchep was a nice first stop to see kangaroos as well as the captive koalas. Our host drove around to ensure that we spied some kangaroos in the wild. We also had a lovely picnic lunch by the beach; sandboarding at Lancelin and a splashing time at Moore River before we made it to Pinnacles. Our host took us to several scenic spots in the park and it was a leisurely trip where we didn't feel rushed though more time at the Guilderton would have been nice. We even had a pre-trip stop for fresh strawberries which she bought for all of us. Nice touch!It felt like and was indeed a full day excursion and with the affable and caring nature of our host and the safe ride, I must say it was a splendid trip! Tour was well organised. Tour guide & driver Susan did a great job ! The Pinnacles was simply eye opening and sandboarding at Lancelin was real fun ! View from the lookout at Moore river was magnificent. H'ever, only sandwiches were served for lunch, could have been better. Value for money overall ! The tour is good and the driver is very friendly! Thank you! A very enjoyable trip from morning till night, felt the pace is just right. First part was an up close personal encounter with kangaroos and koalas at the nat parks these are semi-wilder ones that roam a huge park, not highly domestic ones at a caged zoo. Second was to picnic lunch at amazing seasides close to Lancelin and another spot where two oceans meet. Third was where the sporty fun really is - to the sand dunes and sandboarding...Special thanks to our guide Susan for taking care of us and spending the time guiding us on techniques, fun spots, boardwax tips, bedrock warning spots, and just letting us have one of the best times in WA! Final spot at the Pinnacles for us to ape around like we landed on planet Mars! It was great! Tours with a Twist it is! rien à dire, super journée!